“We want to go Deep Sea Diving in Papua New Guinea”. The lady on the other end of the telephone informed me in a deep Texan drawl. This is terrific, I thought. 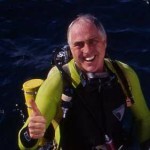 I was in the early years of running a sport diving business in PNG and was mainly involved with a diving school. Diving tourists were rare creatures, and it appeared the lady had brought a whole private planeload with her; her husband, her pilots, her doctor, and a couple of friends. I immediately assured her I could do just that and that we had a brand new boat so we could take her party to the outer Papuan Barrier Reef where there was some splendid “Deep Sea Diving”. 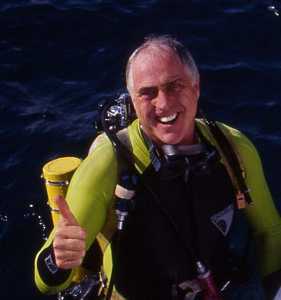 I was getting a twinge of anxiety from the “Deep Sea Diving” bit – people would usually say “Scuba Diving” even in those early days, but “Deep Sea Diving” sounded so much more glamorous and heroic. “Oh!” she exclaimed, “Do we have to go on a boat?” It took me a moment to realise that she had said “boat” – it sounded more like “bowaat”. So I started to promote the beautiful diving on the outer reef and the seaworthiness of our fine vessel Solatai and explained that shore diving around Port Moresby was not very good, when she cut me off. “I was thinking of the poowal”. She meant the swimming pool at the Islander Hotel (as it was then) where they were staying. So then I had a better idea of what I was dealing with and immediately responded “Well of course, madam, no problem at all”. We set a time and I turned up with a van full of diving gear. I think she must have been a fan of Sea Hunt or perhaps she had seen the James Bond movie Thunderball – whatever it became obvious very quickly that she was in charge and was going to share her ignorance of diving with her friends. So I kept quiet, except to enthusiastically support the few things she got right, and made sure nobody came to any harm. Actually they all had a great time fooling around in the pool and flew out the next day for their next adventure being able to brag that they had gone Deep Sea Diving in Papua New Guinea. Now the reason this memory popped into my brain was that there is news of an aquarium being built in Cairns, in fact possibly two different aquariums. Obviously some people believe that these will enhance Cairns and prove to be wonderful attractions, and healthy businesses. Tourists will flock to the Far North to … hang on a minute… I can see it all now! 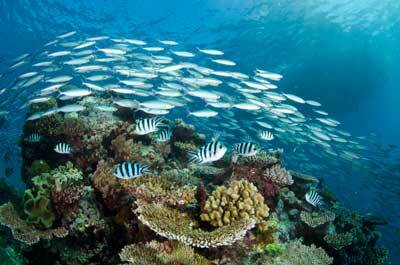 Tourists can come to Cairns to go “Deep Sea Diving in the Great Barrier Reef Aquarium”. They would not have to go on a bowat and get tossed around and get sick when the trade winds blow, they need not worry about getting sunburned nor swept away by the current, nor for that matter get eaten by sharks or shouted at by officious dive masters. And they can still claim they Scuba Dived the Great Barrier Reef. Now I must admit to personally not liking saltwater/coral reef aquariums very much. Historically they are killing machines for fish and invertebrates that have been plundered from the living reef – virtually no fish are bred in captivity. Home saltwater aquariums are typically a disaster and the pathetic, reputedly “calming” tanks found in medical waiting rooms and the like are full of shrunken anemones and sick and lethargic fish doomed to suffer slow deaths. They do not calm me; I get upset! I strongly object to large fish and mammals being kept in small tanks, and feel no remorse when I hear that imprisoned orcas have snuffed out their trainers. Good on them! I hope the proposed aquariums in Cairns will not be displaying mammals and, particularly, big sharks. Not only because the sharks are unlikely to survive for very long but also because it is pitiful to see a magnificent creature like a Tiger Shark confined to a pond when it should be out in the ocean, culling surfers. Years ago Valerie Taylor mentioned to me what a good idea it would be for surfers to paint two large eyes on the bottom of their surfboards. This might be a much better policy for Western Australia, where there has been a spate of shark attacks, than the present intention to cull sharks, including the Great White supposedly a protected species. OK somebody is going to claim I am elitist, and this is not fair because I have certain skills and training and do not get seasick and can get out to the real reef and see the Great Barrier Reef in its true splendour, and they can’t. Yes they want “Equality”! Well I want equality too – for fish! It is quite shameful the way fish are treated as either good eating, or dangerous – or aquarium! In fact I love fish and want to marry a whole school. I know you are going to think me silly – but you know they called John Cleese silly too in his classic film on fish identification. So there. Perhaps there are people who just cannot tolerate being on a boat and are fearful of getting into the ocean, and an aquarium would thrill them. It may even inspire them to overcome their limitations and go out to the reef. Also perhaps there are educational or research programs that could be run in an aquarium that would be difficult to run on the reef. Scientists could pump CO2 into tanks of living seashells and watch them all dissolve. What fun! But I am wondering whether the aquarium will turn out to be a substitute and cause fewer visitors to actually go out to the reef. I have heard it claimed that the amazing and successful Cairns Skyrail ride over the rainforest has led to a decrease in numbers of visitors actually going out and walking in the rainforest. So what is my advice? If you want to go deep sea diving in PNG go out on dive boats Golden Dawn or FeBrina, or go to Loloata Island or Walindi or Lissenung Island Dive Resorts and get in the ocean. It’s fabulous. And if you want to see the creatures of the Great Barrier Reef at Cairns go out with Mike Ball or Deep Sea Divers Den or Tusa Dive or Pro Dive, or one of the other excellent operators. The Great Barrier Reef is still wonderful, and you will experience the Real Thing! Silly is correct. I encourage my students and non divers alike to visit the Georgia Aquarium to see what work they are doing in ocean research, animal treatment and protection. The experience of diving or snorkeling with the many animals they treat so well is a lifetime and possibly changing experience for them. I do agree that aquariums can promote interest in water life. However there is a great difference between home aquariums (which I also possess) or even larger ones in zoos around the world and commercial tanks that are inhabited with animals captured in their natural environment and sentenced to a slow death. Some commercial aquariums (including aforementioned Townsville Aquarium) indeed run side projects like turtle or birds rescue but aren’t they just a PR move? While I agree with you that most people who try to keep saltwater aquariums end up failing, there are quite a few aquarists now with thriving reef tanks, propagating coral and “fragging” it to others in the hobby. Although most of these fish are coming from reefs, the catch for the aquarium industry seems quite negligible, causing not much impact to the marine environment. And the technology available to reefkeeping enthusiasts is miles ahead of where it was even five years ago. Also, aquariums can promote interest of the underwater world to younger and older people unable to dive, or unable to travel. A better understanding can be better achieved, too, with many interactive and demonstrative exhibits. They can also serve as refuges for animals which would otherwise have no chance, like at the Townsville Aquarium with their sea turtle rescue program. I do agree with you that many animals are not given the space that they deserve. When scuba diving the Great Barrier Reef, it is obvious just how much space these fish (and mammals, and every other type of animal) have. Even to see something as small as a butterfly fish contained to less than a cubic meter of space is a bit tragic. Smaller, more stationary animals, like damsels and clownfish, I have less sympathy for (even if it’s Nemo in a dentist’s office), provided they are in an appropriate tank environment, with reef structure, sand, and no ceramic castles.